FIGHT FORECLOSURE! DON'T LEAVE YOUR HOME. SUE YOUR BANK. 50% OF BANKS CAN'T PROVE THEY OWN YOUR LOAN. 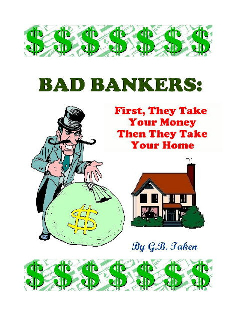 HOMEOWNERS RATE 90% OF MORTGAGE SERVICERS AS BAD BANKERS. YOU HAVE CONSUMER RIGHTS UNDER STATE AND FEDERAL LAWS. SAVE YOUR HOME, SAVE YOUR FAMILY. FIGHT THE BANK AND WIN! LEARN WHAT AN ILLEGAL HOME LOAN LOOKS LIKE AND WHAT TO DO ABOUT IT! 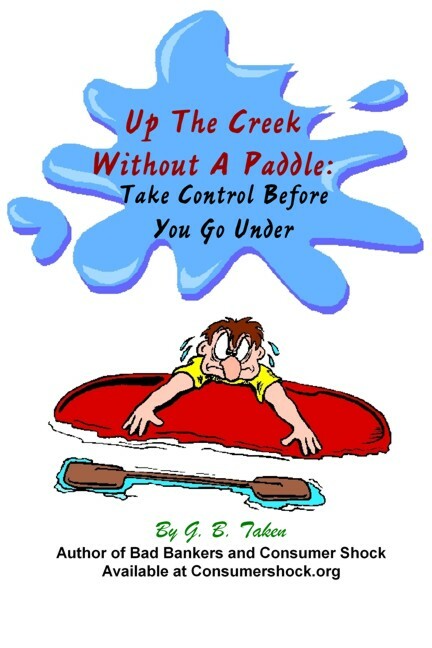 Available as an EBook or Print Copy. AND ARE CONCERNED ABOUT ILLEGAL ACTIVITY AND FORECLOSURE. LEARN HOW TO SUE YOUR BANK AND WHAT TO EXPECT ALONG THE WAY! REGARDING ABUSIVE CREDITORS AND HOW TO DEAL WITH THEM. COVERS A WIDE RANGE OF TOPICS! QUESTIONS CONSUMERS HAVE ABOUT TAKING CONTROL OF THEIR DEBTS. OR A CREDIT CARD COMPANY FROM TAKING ADVANTAGE OF YOU! AND HOW TO SUE YOUR BANK FOR DAMAGES. IS TO FILE A CIVIL SUIT AGAINST YOUR BANK! AFTER THIS PROGRAM, YOU WILL NOT BE FEARFUL YOU WILL BE FIGHTING MAD! DISCLAIMER: G.B. TAKEN IS NOT A LAWYER. 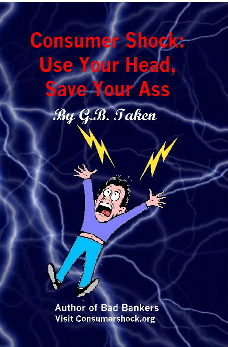 HIS BOOKS AND AUDIO PROGRAM ARE NOT INTENDED TO BE LEGAL ADVICE. THE PURPOSE OF THIS SITE AND THE VARIOUS PRODUCTS AND SERVICES PROVIDED IS TO ASSIST YOU IN IDENTIFYING WHAT MAKES A MORTGAGE BAD AND EXPLAINS WHAT TO EXPECT DURING THE PROCESS OF BATTLING WITH YOUR BANK. BE SURE TO CONTACT AN ATTORNEY IN YOUR AREA REGARDING ANY PROBLEMS WITH YOUR BANK OR MORTGAGE.